Don’t see your perfect Martin here? Christian Frederick Martin was a talented apprentice from a family of cabinet and guitar makers in Germany. Due to a dispute and the possibility of imposed restrictions between the Cabinet Makers and Violin Makers Guilds, C.F. Martin emigrated to America to set up shop and escape the feuding. He quickly established a music shop and guitar workshop in New York in 1833. In 1838 C.F. Martin decided to leave the hustle and bustle of New York behind him and relocate to an eight acre plot on the outskirts of Nazareth, Pennsylvania where the current Martin factory remains to this day. An increasing demand for musical instruments led C.F. Martin decided to enlarge the Martin factory premises in 1850 and increasing guitar production. The years that followed proved to be very lucrative for C.F. Martin & Company. On Febuary 16th 1873 C.F. Martin, Sr. died leaving a lifetime of knowledge in the art of building fine acoustic instruments to his family and the world. 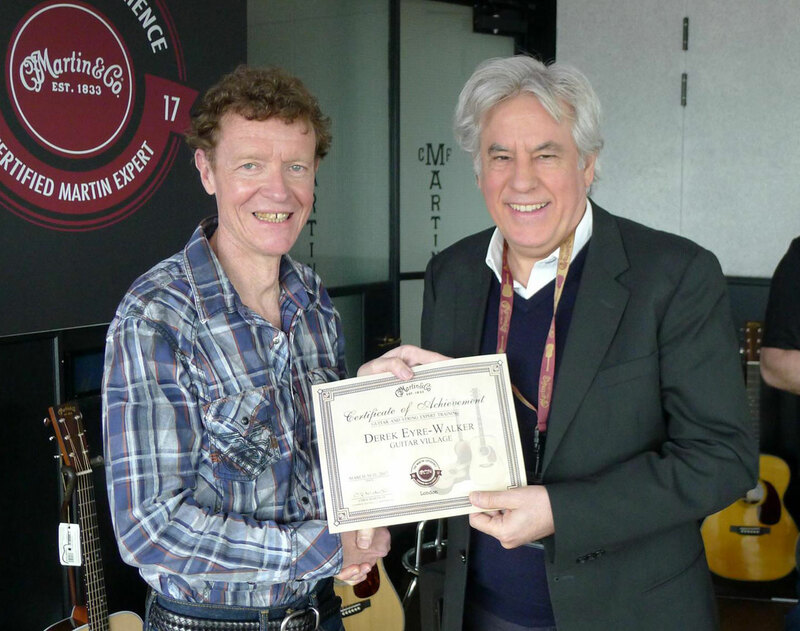 The Martin Guitar Company has remained in the Martin family ever since; the current chairman and CEO, C.F. “Chris” Martin IV (pictured with the Guvnor), being the founder’s great-great-great-grandson. C.F. 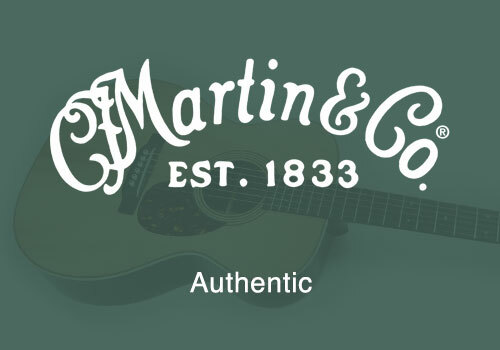 Martin & Co. have been instrumental in shaping the steel-strung acoustic guitar as we know it. Between 1842 and 1843, C.F. Martin, Sr. created the Size 1 model featuring the earliest X-braced top ever documented. The bracing pattern is integral to the tonal characteristics of the instrument and provides structural stability as well as allowing the top to resonate. The X-bracing pattern is now widely used by other makers due to its rigidity and bold tonality. From the 1850s on, Martin would gradually increase the size and variety of its models. In 1902 Martin introduced their large-bodied 12-fret 000 size; a guitar designed to compete with the volume of mandolins and banjos. Martin modified the 000 (or “OM” Orchestra Model) to accommodate 14 frets clear of the body, instead of 12, for star banjo player Perry Bechtel who wanted to switch from the long-necked plectrum banjo to the guitar. In 1916 the company continued to design and build for Oliver Ditson Co. of Boston, Philadelphia and New York, including the first full-size “Dreadnought” guitar named after the class of large British battleships. The large size was to provide bass for vocal accompaniment, as well as greater volume. 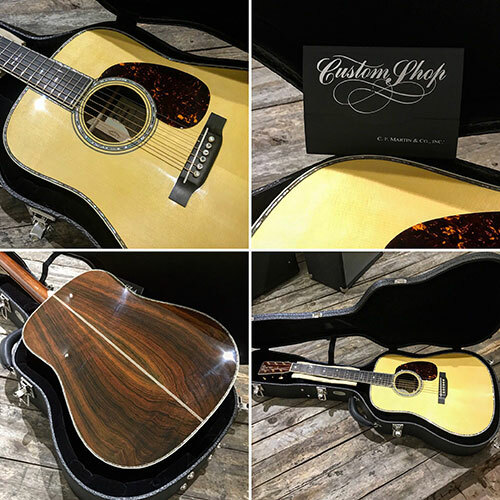 The dreadnought shape and name has become a standard among all acoustic manufacturers. Rather than rest on its considerable laurels, Martin have branched out over the decades into electrics, sustainable FSC certified tonewoods, eco-friendly composite materials such as Richlite (an ebony substitute), and High Pressure Laminate (HPL) wood for bodies and necks – cost-effective and tough as hell! (available on the X series). 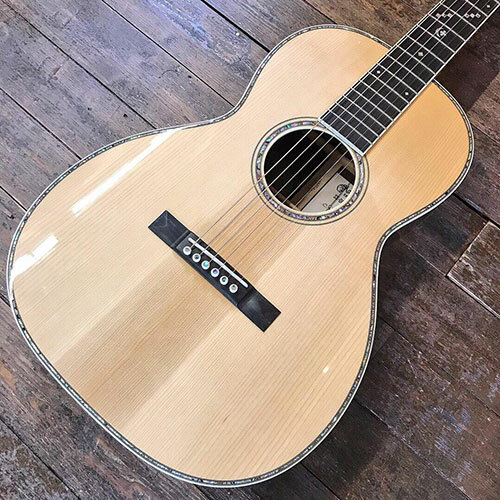 Recently they have introduced their Vintage Tone System (VTS) – an ingenious process of ageing the wood to produce the warm “played-in” characteristics of a true vintage acoustic. 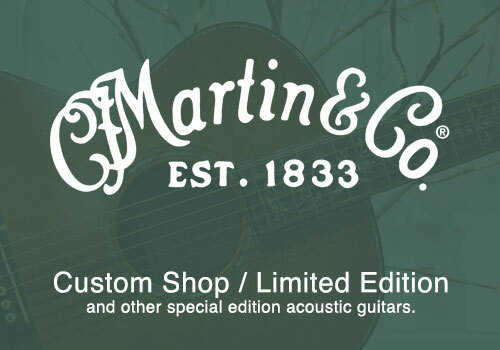 Martin Custom Shop / Limited Edition – The Martin Custom Shop and Limited Edition Series offers players and collectors something a little different. 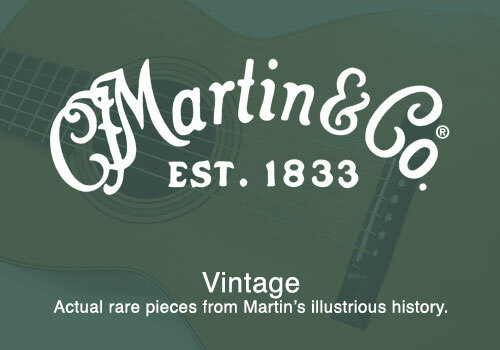 These rare and special Martin guitars are available in limited numbers and will not only sound sweeter over time but increase in value due to their rarity! Models include the Martin CS-CF Martin OUTLAW-17 (the only one in Europe! ), the ornate Martin SS-0041GB-17, and Martin D-28E UK Limited Run – classic Martin models with added Fishman electronics especially for the UK market. Martin Authentic – The clue is in the title; Martin have gone to extreme lengths to reproduce these fine pieces from their illustrious history. Meticulously handcrafted using original methods, these acoustics are as true to the original vintage instruments as you can get. Features include authentic bracing patterns, VTS tops, Golden Age relic side mount tuners, dovetail neck joint with hide glue construction. 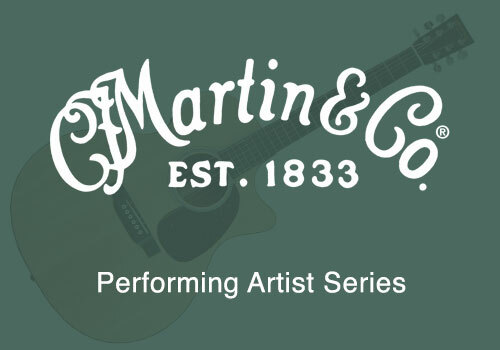 Models include the Martin 000-30 Authentic 1919 and Martin D-18 Authentic 1939. 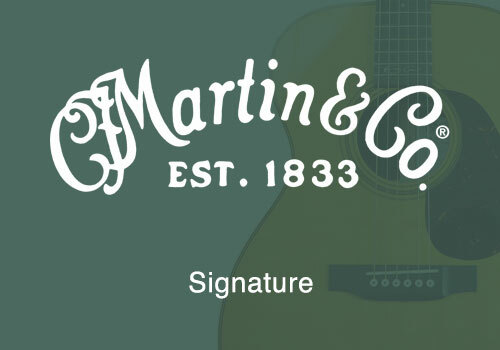 Martin Signature – Many artists past and present have collaborated with Martin guitars be it from a design point of view or a reproduction that captures the magic of an iconic instrument. The Signature Series allows you to experience this magic for yourself. 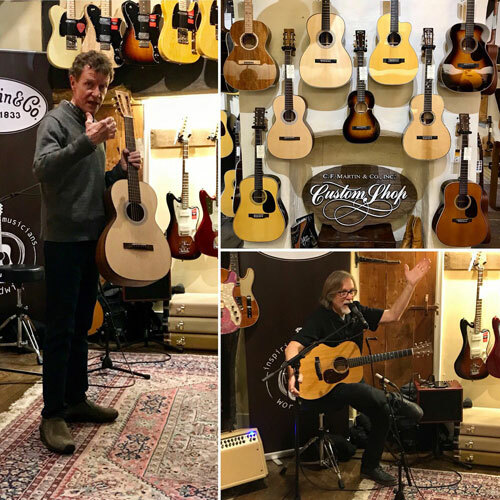 One of the most popular models in this range is the Martin 000-28EC Eric Clapton, based on Clapton’s iconic guitar of choice for the MTV Unplugged album. Other notable models are the Martin D-28 John Lennon – a tribute to the legendary Beatle, Martin RM50 Ralph McTell Anniversary, and the brand new Martin Ed Sheeran ÷. Martin Retro – Premium classic Martins fitted with state of the art electronics ready for the stage. These traditional fine instruments are fitted with the Fishman F1 Aura Plus System. The concept is simple; take an original instrument from the Martin museum, for example a D-18, record it with nine different premium studio microphones then, with the magic of the Fishman Aura, emulate those mic characteristics. These make up your onboard presets reproducing those sounds without the need for awkward and expensive equipment. Not only that but they are instrument specific so, for example, if you purchase the Martin HD-28E Retro it would have been recorded with an original Martin HD-28. Click HERE to check out Diane Ponzio demonstrating the genius of this system. Martin Standard – The oldest original remaining series in the Martin line up and the very foundation which C.F. Martin & Co. was built on. These high-end instruments use only the best select solid tonewoods finished in a stunning high gloss lacquer. Features include mother of pearl inlays, ebony bridge and fingerboard, bone nut, and a robust moulded hardshell case. Key models include the Martin D-45, Martin D-28, and Martin OM-21. Martin Performing Artist – Ready for the stage the Performing Artist Series offers the professional player a cutaway acoustic with various different tonewood combinations and a modern comfortable neck profile. Features include the Fishman A1 Analog System, FSC certified richlite fingerboard, solid tonewoods, hardshell case. Models include the ever-popular Martin GPCPA4 and Martin OMCPA4 Rosewood. 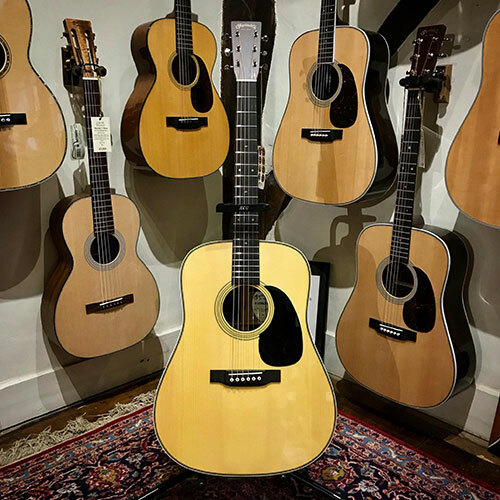 Martin 17 Series – If you are looking for a warm soft tone with a vintage vibe at a mid-range price point look no further than the 17 Series. The solid spruce top, solid mahogany back and sides and rosewood fingerboard provide the soft, warm clear tones. Other features include Golden Age relic tuners, authentic script logo, hardshell case. Models include the Martin 000-17 Black Smoke, and Martin 000-17E Whiskey Sunset. Martin 16 Series – Features solid body woods with a solid spruce top delivering a bold tone with a bright top-end; a hugely versatile acoustic. The 16 Series also features a solid mahogany neck, FSC certified richlite fingerboard, hardshell case. Martin 15 Series – If you are looking for well-balanced, articulate, clear tones that respond well to fingerpicking then the 15 Series is for you. The 15 Series features an all-solid mahogany body and neck, solid rosewood fingerboard, hardshell case, and electric models feature the Fishman Matrix VT Enhance. Models include the Martin GPC-15ME, Martin 000-15 Special, and, new for 2017, two aged Streetmaster Worn Satin Mahogany Burst D-15M and 000-15M. Martin Road Series – Designed for intermediate to experienced players the Martin Road Series is very affordable and features a solid tonewoods, select hardwood neck, FSC certified richlite fingerboard, Fishman Sonitone pickup, hardshell case. Martin X Series – These exceptionally good value acoustics give beginner to intermediate players the chance to own their very own Martin acoustic guitar. The X Series features a solid top on most models, environmentally friendly High Pressure Laminate (HPL) back and sides, FSC certified richlite fingerboard, and Fishman Sonitone pickup. 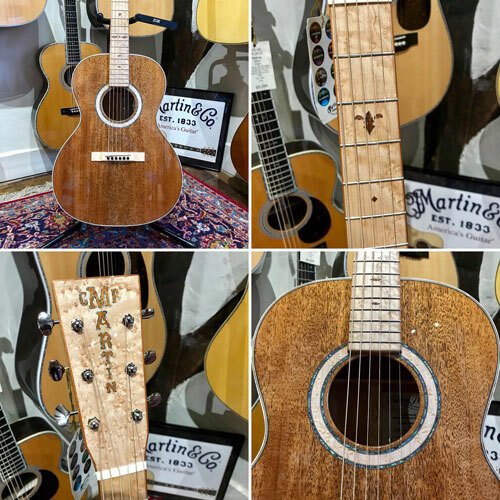 Models include the Martin DX1KAE with koa pattern back and sides, Martin GPX1AE with a sold Sitka spruce top, and Martin DCX1AE dreadnought. Little Martin and Dreadnought Junior – Martin’s popular travel acoustics are compact but deliver a big sound. These instruments are ideal to take in the camper van, take on the plane or even just sit on the couch at home, they equally make great student guitars for young beginners. The LX1E Little Martin is also the guitar that helped propel Ed Sheeran to mega-stardom. Models include the Martin LX1, Martin LX1E with a Fishman pickup, Martin DJRE Dreadnought Junior – all including a rugged lightweight gigbag. 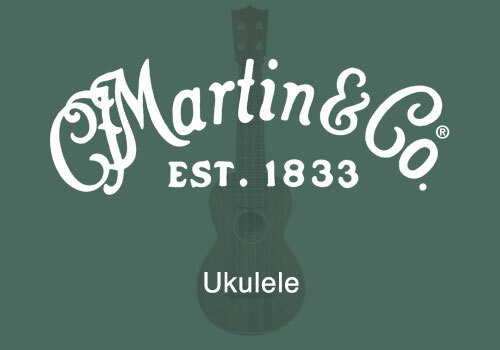 Martin Ukulele – Ukuleles have been part of the Martin repertoire since 1917 and have maintained a strong line-up for a hundred years. Built to the same high standards as Martin guitars and with a variety of specs. With a company as old and prestigious as C.F. Martin & Co., we mustn’t forget the pre-owned/vintage guitars out there. Guitar Village have seen some amazing genuine vintage Martins come through the doors over the decades. Recently we’ve had a D-28 (1940), 2-17 (1924), 0-18 (1936), 0-42 (1899), 1-21 (1870), and a D-18 (1955). 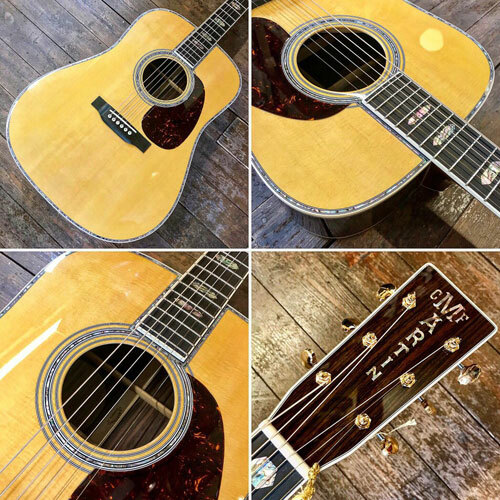 Vintage Martin acoustic guitars really can vary in price, some of them reaching astronomical figures depending on age, model, rarity and condition but it is possible to bag an historical Martin without having to rob a bank.